In the age before CGI, many of the biggest special effects shots in film history were only possible because of models and miniatures. The old-school art of modelmaking has diminished in recent years -- although some notable miniatures recently cropped up in projects like Blade Runner 2049 and Interstellar -- and audiences certainly seem to be drawn to the novelty of these kinds of practical effects. Director Damien Chazelle has an affinity for them, too, using miniatures for some key scenes in his new docu-drama moon landing saga, First Man, including shots of the launch of the massive Saturn V rocket, used to shuttle astronauts in the Apollo program, and spacecrafts en route to the lunar surface. The director turned to miniature effects supervisor Ian Hunter, a Visual Effects Oscar winner for his work on Interstellar, to oversee the creation and filming of the models. Hunter assembled a team in Atlanta, where First Man was shot, to build models and film them on a shooting stage. The first was the Saturn V rocket miniature, including its gantry (or support structure), built at one-thirtieth scale -- which still meant it was 14 feet tall. It was devised first as a 3D computer model based off of NASA blueprints and photographs, then printed into parts with a 3D printer. "We had banks of 3D printers running day and night, running off pieces," said Hunter. "We also used a lot of laser-cut pieces. The tube-like shape of the rocket came from PVC piping, with the gantry made of acrylic tubing, along with many 3D printed and laser cut parts." The Saturn V model made an unplanned appearance in one of the film's trailers, and ultimately, it made the cut into the movie, when the filmmakers wanted a quick shot of Neil Armstrong (Ryan Gosling) looking up at the rocket. "We'd already shot the miniature when they asked for this," recalled Hunter, "but then our director of cinematography [Linus Sandgren] said, 'Why don't we wait until about 4:30 in the afternoon when the sun is the right spot and we'll get all these beams of sunlight coming through?' That shot was kind of an afterthought, and it's in the movie." Another set of miniatures made by Hunter's team were the Command/Service Module and Lunar Excursion Module, the two ships that would take the astronauts to the moon and back. These were constructed at one-sixth scale, a large size for miniatures, but necessary to add in enough detail to look realistic. They were also constructed via 3D printing and from hand-sculpting various materials. 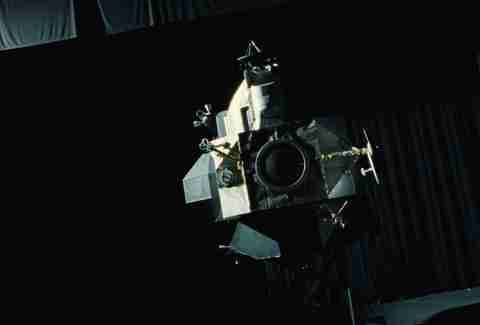 To film a docking sequence with the spacecraft, the miniatures were placed on three-axis model-movers -- basically, hydraulic platforms that spin the miniatures as they would in space. They were usually shot in front of giant black curtains, but projections of the Earth and Moon surfaces were also used to add interactive light. 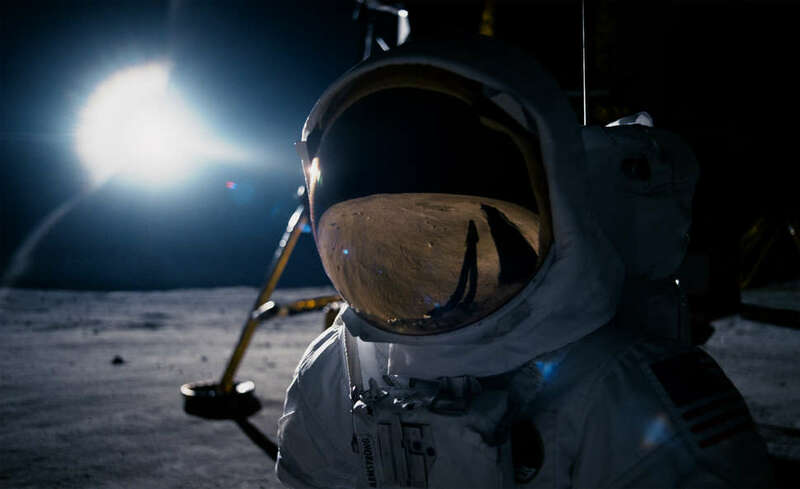 Realism was always a key aspect in relying on miniatures for First Man, and one thing became apparent after printing relatively pristine model pieces: The miniatures needed to be roughed up. 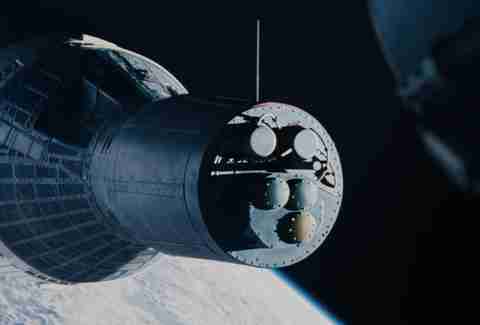 "The real ones were made by NASA by hand and used the barest minimum of materials," said Hunter. "The skins of the lunar module were very thin and the command service module skins were dimpled and wrinkled where the had been riveted together. So for the lunar module skin, one of our guys took a heat gun and pre-heated and bent and distorted all of the plastic skin and then cut that apart, attached it and then hand-pounded rivets onto the edges so that you saw the deformation that you would expect to see from sheet metal." 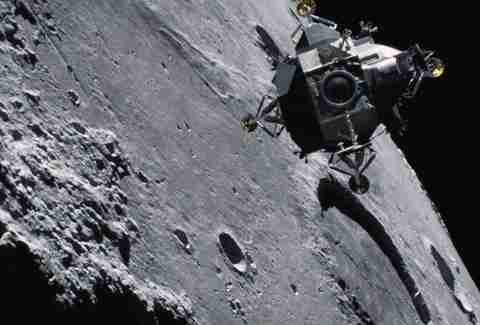 First Man's miniatures were, of course, just part of the bigger visual effects solutions. There are plenty of CG additions in the film, and the miniatures themselves were digitally composited into space backgrounds. But, starting some of the scenes with miniatures was a favorable way of acquiring a certain kind of image that can be harder to achieve with CG, according to Hunter. "You get these artifacts, these imperfections that are reality, and that you automatically get from shooting a miniature." "In some ways, we felt like we were just documentarians," Hunter added. "We set up this shooting space. We set the camera up. We set up a light and we point the camera at the miniature and there it was, that's what we got. It's reality. There's no denying it's real." Ian Failes is a freelance visual effects writer. He's on Twitter @vfxblog.